The masters of war (“those who make the big bombs”) have been exposed in leaked US State department documents showing a cruel indifference to human suffering in Yemen. The Houthis, a Shiite Muslim community within Yemen, launched a movement in 2004 to overthrow a pro-US and pro-Zionist government. Backed by Iran, they have made considerable gains in the course of their struggle, and in 2014 took control of the capital, Sana’a, and most of the north of the country. The previous government was supported by US imperialism through an alliance of nine pro-US states in the Middle East and Africa led by Saudi Arabia. They had supported it militarily but intervened directly after the government fell in an operation called Operation Desert Storm. They were joined by the US imperialist private mercenary army Blackwater (now Academi) and supported by the placement of US and British military personnel in the command and control centre responsible for Saudi-led air strikes on Yemen. Civilian Yemenis have suffered through blockades on Yemeni ports by the Saudis and others. Starvation and disease have compounded the devastation of Saudi-led bombings and missile strikes. Last November, the Australian navy showed its indifference to the suffering by joining the Saudi navy in a training exercise not far from the location where the Saudi-led coalition was enforcing its naval blockade of Yemen. With seven million Yemenis now starving, and 17,000 civilian deaths from Saudi military aggressions, the conflict has become a political embarrassment for the US imperialists who always try to cover their imperialist aims under the cloak of “humanitarianism”. This leads to contradictions within US ruling circles. In the US Congress, a bipartisan group of lawmakers has been trying to cut off American military aid for Saudi Arabia and the United Arab Emirates. Their efforts were intensified last month when a Saudi air strike, using US-made missiles, struck a bus carrying school children, killing more than 40. Their efforts were directed at Raytheon Corporation which plans to sell more than $2 billion in precision-guided missiles to Saudi Arabia and the U.A.E. Two days ago, the Wall Street Journal cited a classified memo showing that US Secretary of State Mike Pompeo had intervened to overrule concerns from most of the State Department specialists involved in the debate who were worried about the rising civilian death toll in Yemen. Pompeo overrode fears that more civilians would die in order to allay fears Raytheon would miss out on sales of more than 120,000 precision-guided missiles. 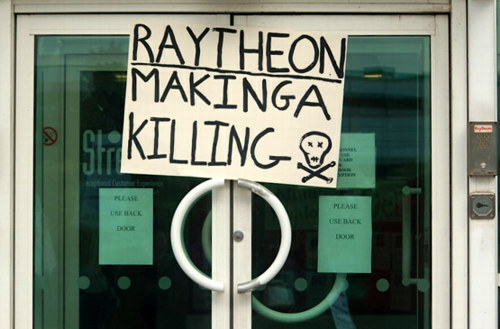 Raytheon has previously been the target of anti-war groups in Australia where it has a number of offices of production facilities. Radical Christians entered its premises in Brisbane and tried to “exorcise” it, and several groups in South Australia opposed its “mentoring” of school students. It should be kicked out of Australia altogether. It will be when we win anti-imperialist independent state power.